With their main influences being Gary Moore, Jimmy Page, Jimi Hendrix, Cream and Santana, Bare Wire, was established in late 1993 with Neil Young, Free, Bad Company and Roy Mette counting as just a few of their musical inspirations. Although they deliberately didn't gig until 1994 they made their first studio album in order to secure bookings. Establishing a successful monthly blues rock club upstairs at The Bell in Horndon-on-the-Hill, featuring some high-quality guest performers they went on to gain regular gigs at venues such as The Palace Theatre, Westcliff-on-Sea, The Towngate Theatre, Basildon, Truckworld, The Billet and the Hermit Club to name but a few. In 1996, they supported Denny Newman and Tony McPhee at the Juke Joint and made a second CD, “Blues on the Line” produced by Grant at Adelaide Studios. which included some of their own original numbers. In the summer of 2006 the band played at Horndon Live to rapturous applause and were interviewed afterwards by Phoenix FM. ​2007 to 2015 were great years for the band with regular bookings at a great many venues in and around Southend. 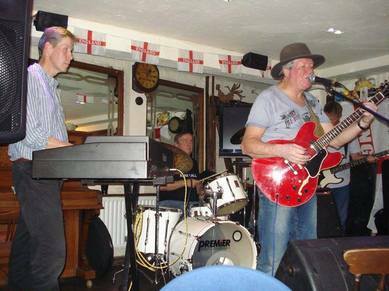 ​They love playing blues and hard rock numbers that people can join in with and dance to. As well as playing covers, the band also write and perform their own numbers. And so on to 2016 with still more venues added such as The King’s Head and The Miley in Rochford; The Railway Pub, Southend-on-Sea and The Plough, Westcliff-on-Sea. They feel they have arrived at a tight, settled line-up with Pete Bailey and Joe Parker being joined by the excellent Steve Reynolds on drums and star bass man Gareth Davies. Joe Parker, also has a band called Slow Loris, plays in folk rock band Grand Reunion and works a lot with star violinist Charlie Skelton. Gareth Davies is probably best known as bass guitarist with Bob Collum. Steve Reynolds is also in surf band The Exterminators and party band The Dancing Monkeys. Sadly, original drummer, Clive Graham, died last April, however, after trying out a few replacements, Steve Reynolds has now become a fully established member of the band.